This is a copy of a paper in ACJS Today, Newsletter of the Academy of Criminal Justice Sciences, 22(2):1, 3-5, 2002. Also available in pdf format (with comments and replies). Please cite as: Deflem, Mathieu. 2002. 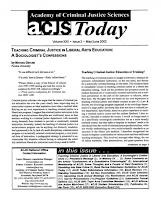 “Teaching Criminal Justice in Liberal Arts Education: A Sociologist’s Confessions.” ACJS Today, Newsletter of the Academy of Criminal Justice Sciences, 22(2):1,3-5. — From course evaluations for Criminal Justice (SOC 328). Criminal justice scholars who argue that the status of criminal justice education has over the years clearly been improving may to some extent express an ideal aspiration more than a realized ideal. Relying on my own experiences in teaching criminal justice in a liberal arts program, I suggest that criminal justice instructors in the setting of a social-science discipline are confronted, more so than teachers working in a criminal justice department, with unusually strong demands from students to provide a vocationally oriented instruction. Ironically, indeed, the teaching of criminal justice in a social-science program can be anything but distinctly academic, but is pressured to be, by lack of a multi-disciplinary criminal justice program or a technically oriented vocational program, a very practical form of instruction. A pedagogical strategy is presented to accommodate this situation without having to relinquish the scholarly ambitions liberal arts instructors must always seek to fulfill. Teaching Criminal Justice: Education or Training? The teaching of criminal justice is caught in between a demand for scholarly substantiated instruction, on the one hand, and desires for a practically oriented training, on the other. This situation leads to remarkable ironies in the teaching of criminal justice in the setting of liberal arts education in terms of the problems and prospects posed by student demands for a vocationally oriented instruction and a stubborn persistence to educate, rather than train, on the part of the instructor. My thoughts here are based on my own experience in teaching criminal justice and related courses as part of a Law & Society and Sociology program organized in the sociology department of a large public university that does not have a criminal justice department. Specifically, based on a prior experience in teaching a criminal justice course and the student feedback I then received, I decided to redirect the course and no longer teach it as a specifically sociological contribution but as a more broadly oriented course that seeks to respond to students’ needs to be introduced into the world of criminal justice professionalism, while not wholly undermining my own social-scientific standards as an educator in the liberal arts tradition. I therefore re-organized the course to employ a combination of various more and less traditional teaching techniques. This involved, amongst other things, the use of online materials, video presentations, and guest-speakers from agencies across the criminal justice spectrum. Results of this experience inform my ideas on the current place and future role of criminal justice as a social science and/or research domain in the world of higher education. In particular, I suggest that instructors of criminal justice in such a setting are confronted with pressures that teachers in a criminal justice or a law and society department, whatever their disciplinary background, may not face. The status of criminal justice as a research domain or discipline in the university has been a topic of considerable debate (Clear 2001; Cullen 1995; Farrell and Koch 1995; Flanagan 2000; Marenin and Worrall 1998). Since the expansion of criminal justice courses and programs in institutes of higher learning some 20 to 30 years ago, professors of criminal justice have been given an uneven, ambiguous reception for their work. Some argue that criminal justice should be considered a social science and should be developed and nurtured along those lines (Marenin and Worrall 1998). Others have suggested that criminal justice is already a social science and has been accepted in the academic community (Bernard and Engel 2001; Cullen 1995). Still others suggest that although criminal justice is not a discipline but a multi-disciplinary research domain, it has matured to take up a distinct and respectful place in the academia (Clear 2001). However, perspectives are also defended about the place of criminal justice in our colleges and universities that are more pessimistic —more realistic, some would say. Criminal justice, it is argued, is not and does not need to be a social-science discipline or a scholarly domain of study, but should be a useful breeding ground for criminal justice professionals. This perspective defends the notion that criminal justice should be a vocational program of instruction. Curiously, members of the academia who are not involved in teaching criminal justice sometimes join in on this perspective, but for different reasons. They are, on the one hand, those who offer vocational programs of instruction in other technical subject matters. On the other hand, they are those social scientists and disciplinarians who seek to marginalize criminal justice (and related research domains) by pushing it away from their own respective disciplines. Since my appointment as assistant professor of sociology some five years ago, I have been confronted with the pleasures and pains of teaching criminal justice in a sociology department that offers a major both in Law and Society and in Sociology. The course is simply called ‘Criminal Justice’ and, although the reference to sociology is included it the course number (‘SOC 328’), its connection to the discipline in which I was educated, and in which I wish to educate, is often far from clear. From my first experience teaching Criminal Justice until later, the implications have gradually become more obvious to me. My experiences may be more or less idiosyncratic and subject to revision, but I hope readers of this newsletter can learn from and/or disagree with my thoughts. The first time I taught Criminal Justice, I decided to teach the course as a sociologically oriented course, though not exclusively. I selected a short descriptive textbook about the criminal justice system in the United States and supplemented it with scholarly papers about a variety of sociological issues of criminal justice. Additionally, I interspersed my discussions with brief excursions on sociological theory. In fact, the first reading outside the textbook occurred already during the first week of class (Durkheim’s  paper on the morality of science). I was very clear in introducing the course from the stated sociological approach, and I pointed out that I was not a criminal justice scholar and, even more clearly, not a criminal justice professional. For the first time I then introduced my now standard joke that although throughout my life I have had considerable involvement with the criminal justice system, most of these experiences have come from ‘the other side of the fence.’ I further pointed out that the course number of the class (‘SOC 328’) explicitly placed the course in a sociological framework, as did the fact that our university does not have a criminal justice program but instead offers a sociology and a law and society major. After my first experience, I felt fortunate to no longer have to teach Criminal Justice, which was now taken care of by an intelligent colleague who was much better versed in the workings of the criminal justice system. However, when two years ago he left for a better job, I again had to teach the course. My immediate reaction was to teach what would surely be the easiest class anybody could ever take at the university. I also decided to recruit heavily from the courses I was teaching at the time, advertising the course as easy, fun, and a wonderful opportunity to ‘watch me sell out big time!’. Yet, fortunately, that is not what happened, for from the seeds of spite grew what would be a great experience for the students and their instructor alike. I had initially planned to make the course easier by having a lot of videos being shown in class. These videos would show students inside perspectives of the criminal justice system. However, as I contemplated organization of the course further, I started to think that it could well be possible to make the course both fun and valuable. I decided to combine various techniques to offer a comprehensive but straightforward overview of the criminal justice system, with a clear and distinct view to present materials worthwhile for future criminal justice professionals. This integrated method of instruction comprises various components, including an introductory criminal justice textbook, videos, and guest speakers. The textbook provides a straightforward and descriptive, if somewhat critically oriented bird’s eye view of the four-part criminal justice system (crime and criminal law; police; sentencing; and punishment). However, I would not lecture the textbook apart from some brief summaries to emphasize key points. Instead, I provided students with a relatively lengthy, online available list of questions from which I would draw the exam questions. Students were encouraged to find the answers to the questions independently, and could contact the instructor if they had any questions. This method alleviated me from the gruesome task of memorizing technical information on the criminal justice system, while the students would still be able to learn the basic elements thereof. The addition of videos to show inside perspectives of various professions in, and professional issues of, the criminal justice system proved highly beneficial. The strategy also allowed for multiple writing assignments. As I further contemplated the functions of such video presentations, it dawned in on me that I could also invite criminal justice professionals to function as guest speakers. This turned out to be by far the most exciting aspect of the course. I first held a survey in class to estimate how many students had a future in criminal justice in mind and in what capacity. The results pointed overwhelmingly in the direction of students having professional, rather than scholarly interests in criminal justice: more than 95% of the class envisioned a career in criminal justice. Of these, about half looked ahead to a career in law enforcement or forensics; about a third wanted to go to law school (of these, more than half defined this as a criminal justice interest), and the rest of the students wanted jobs in social and legal services and corrections (the latter was by far the smallest group). Since I was not all that familiar with local criminal justice agencies, I asked students to pass on names of people working in criminal justice whom they knew. I suspected that many or some students would already be involved in criminal justice practice, either directly through internships or part-time jobs, or indirectly through their parents or acquaintances. The strategy was highly successful. Clearly, a criminal justice course such as mine is attended by students who know much more about the system and its members from a professional viewpoint than their instructor. The class enjoyed no less than 12 guest speakers from all aspects of the criminal justice system (including a criminologist, a public defender, a judge, a corrections officer, and various law enforcement officials, including the local chief of police, a conservations officer, and an FBI Special Agent). The course evaluations were all-around positive, and the use of guest speakers was widely applauded. In his recent presidential address to the Academy of Criminal Justice Sciences, Todd Clear (2001) suggested that criminal justice has come of age as an autonomous research and teaching enterprise. To wit, criminal justice education in the United States now incorporates some 25 Ph.D.-granting criminal justice programs, over 100 masters programs, and many hundred bachelors programs. However, these programs are not all part of liberal arts education and, instead, may comprise many vocational programs. Indeed, the number of vocationally oriented criminal justice programs, especially in regional and community colleges, has expanded tremendously since the 1960s (Farrell and Koch 1995). The rise of these technically oriented programs may nurture a view of criminal justice education as very popular among students but marginal among academicians outside of criminal justice. As a result, criminal justice education is often seen as a mere training ground for law enforcers, correction officers, and other criminal justice professionals. With the rise of the internet, cyber-colleges, and online education, this situation may have worsened. For instance, on the internet there exists an ‘Institute for Criminal Justice Education,’ which advertises as a “nonprofit corporation which provides training, develops courses and distributes research material relating to investigation, management and technology in the criminal justice arena” (http://www.icje.org/). Thus, when criminal justice scholars argue that criminal justice education has been expanding quantitatively and improving qualitatively, that criminal justice programs are contributing more than ever to higher education, and that criminal justice has grown and developed steadily to become a research domain and/or discipline in its own right, these contentions may be more reflective of a hope and aspiration than an already realized ideal (Clear 2001; Cullen 1995). One important source of a sobering realism, perhaps even active resistance, to the maturation of criminal justice lays outside the field. Indeed, criminal justice is at once popular among students and marginalized in the academia because it is seen as a surrender to market demands for pre-professional training (Flanagan 2000). Many non-criminal justice academicians conceive of criminal justice programs as weak ‘cop shops,’ which at best serve a useful financial role in the academia as ‘cash cows’ (see Clear 2001). Importantly, these perceptions may function as a self-fulfilling prophecy, for which reason the criminal justice major fails to attract the best students, in turn affecting the standing of the major. Also from within the criminal justice community, there still are problems in defending criminal justice as a respectful member of the higher education community. For one thing, there is still discussion, even among the leading criminal justice scholars, whether criminal justice is, as Todd Clear (2001) argues, a research domain that borrows its conceptual and methodological apparatus from other disciplines, or whether, as Frank Cullen (1995) maintains, criminal justice has matured into a social-science discipline because it does not just draw from other social sciences but integrates theoretical, methodological, and empirical frameworks in a coherent scholarship on criminal justice. The very fact that these exemplars of criminal justice scholarship still have to discuss these issues (and do not arrive at the same conclusion) continues to feed suspicions on the part of scholars outside of the criminal justice field. Providing an additional ground to worry about the academic aspirations of criminal justice from within its own boundaries, criminal justice textbooks typically do not conceive of criminal justice as an academic enterprise (but as an institution or system in society); have no or insufficient attention for critical and problematic issues of the actual workings of the criminal justice system from a broader than technical approach (thus, amongst other consequences, neglecting the political nature of criminal justice, and racism in the criminal justice system); and fail to integrate criminological, sociological, and socio-legal theories (Farrell and Koch 1995). In my view, the adequate response to this problem is not to adopt a so-called critical, extra-scientific approach of liberalism in teaching criminal justice (Deflem forth., 1998). For the worst problem of available textbooks in criminal justice is not so much that they are (politically) conservative, but that they lack a solid foundation in a social science discipline. What are the implications of the ambiguous reception of criminal justice in the academia for criminal justice instruction? I suggest that a fundamental irony behind the specific pressures placed on a criminal justice course relates precisely to its placement in either a sociology (or other social-science) program or a criminal justice department, but not in the direction one might suspect, namely that sociology and other social sciences can afford academic criminal justice courses more than multi-disciplinary departments of criminal justice can. Quite on the contrary, I suspect that criminal justice departments are much better equipped to teach criminal justice from a multitude of viewpoints, some more professional and some more academic in orientation. Frank Cullen (1995) rightly suggests that it is typically only in a criminal justice department that a course on criminological theory will include sociological, psychological, legal, and many other scientific perspectives of crime. Flanagan (2000) likewise argues that criminal justice education can fulfill a useful function because and when it provides a broad, general, and critical instruction on a central problem in society. I would further argue that this broad form of criminal justice education is in principle more easily accomplished in criminal justice programs rather than in (other) social-science programs that typically offer only one criminal justice course and thus face stronger pressures to have this one (and only) course be organized as a vocational course. Indeed, the richness of teaching integrated, multi-dimensional courses in criminal justice programs is not possible in sociological or other social-science departments that organize criminal justice courses. Thus, it is a strange irony that, as in the circumstances I have described for my criminal justice course, the teaching of criminal justice can be anything but distinctly sociological but is pressured to be, by lack of a broader oriented criminal justice program or a technically oriented vocational program, a very practical form of instruction. But this is just part of the story, for the surrender to teach practically in one course may be complemented by other courses where a strong academic orientation within a disciplinary framework remains the center of attention. The trick is this, then, that I teach Criminal Justice as a practical course, but that I remain, and that students allow me to be, as sociological as it gets in my other related courses for the law and society and sociology majors. For instance, I teach a course on Criminology that reviews the leading sociological schools of thought on crime and social control. It is a theoretically founded and research-oriented course that reviews analytical concepts, modes and instruments of research, criminal policy perspectives, and selected empirical works in selected traditions of a wide spectrum of intellectual developments. In this course, I manage to explain the minimum conditions of causality (time-order, non-spuriousness, and co-variation) as easily as I can play rap songs to discuss the value of ethnographic research in the study of the criminalization of graffiti. Ironically, then, I can be sociological to the extreme in other courses, in part because I choose not be in Criminal Justice. The strategy comes at the expense of neglecting social-science perspectives of criminal justice (discussed only indirectly through an additional sociology of law course), but the sacrifice may be tolerable and, ultimately, beneficial in advancing a broad based liberal-arts instruction. Previously presented at the annual meeting of the American Society of Criminology, Atlanta, GA, November 2001. Bernard, Thomas J., and Robin S. Engel. 2001. “Conceptualizing Criminal Justice Theory.” Justice Quarterly 18:1-30. Clear, Todd R. 2001. “Has Academic Criminal Justice Come of Age?” ACJS Presidential Address, Washington, DC, April 2001. Justice Quarterly 18(4):709-726. Cullen, Frank. 1995. “Fighting Back: Criminal Justice as an Academic Discipline.” ACJS Today 13(4):1,3. Deflem, Mathieu. forth. Review of ‘The Politics of Injustice: Crime and Punishment in America,’ by Katherine Becket and Theodore Sasson. Contemporary Justice Review, in press. Deflem, Mathieu. 1998. “The Democratic Deficit Revisited: Considering the Politics of Criminal Justice.” Pp. 111-117 in Politique, police et justice au bord du futur: Mélanges pour et avec Lode Van Outrive, edited by Y. Cartuyvels et al. Paris: L’Harmattan. Durkheim, Emile. (1887) 1972. “The Science of Morality.” Pp. 89-107 in Emile Durkheim: Selected Writings, edited by A. Giddens. Cambridge: Cambridge University Press. Farrell, Bill, and Larry Koch. 1995. “ Criminal Justice, Sociology, and Academia.” The American Sociologist 26:52-61. Flanagan, Timothy J. 2000. “Liberal Education and the Criminal Justice Major.” Journal of Criminal Justice Education 11:1-13. Marenin, Otwin, and John Worrall. 1998. “Criminal Justice: Portrait of a Discipline in Process.” Journal of Criminal Justice 26:465-470. Additional comment: “Independence Day: Rejoinder to Professor Deflem,” by Craig Hemmens, ACJS Today 22(4):11-12, 2002; and Letter by Deflem, ACJS Today 23(1):13, 2003. All comments and replies are available in this pdf file. Published in ACJS Today, 22(4):10-11, 2002. I am puzzled and distressed by the many misrepresentations of my essay on the teaching of criminal justice and the unjust criticisms on my educational accomplishments in Craig Hemmens’ “Reply.” Most disturbingly, the “Reply” is a highly selective, inaccurate, and biased representation of my essay. Parts of sentences of my essay are quoted out of context and reassembled in new statements which appear nowhere in my essay and which I would never defend. In fact, every single quotation from my essay in Hemmens’ “Reply” constitutes a misrepresentation from the original. By means of example, I never said that I ‘sold out’ by reorienting my course. The point was precisely that I was not going to do that, and I never did do that. Instead, it was out of respect for my students and their needs and desires that I redirected my course in a manner that was still determined by me as a responsible instructor. I am saddened to see anyone question my teaching record. I never stated in my essay that I received poor teaching evaluations or that my students responded negatively to my approach. I will not deny these accusations. I leave that up to my students. Neither will I comment on the personal nature of this attack. I leave that to the reader. I do reiterate that I experienced no dismay on the part of my students. I only noted resentment from two course participants. The narratives from my teaching experience were not offered as anecdotal evidence, but as illustrations of the context in which my teaching decisions were made. My remorseful revelations cannot be confused with the justifying principles that guided my pedagogical choices. I never displayed any defensiveness in my teaching, nor do I think that I lack relevant knowledge about criminal justice. I am saddened by any unfounded accusation to the contrary. More generally, “whoever denounces someone wants to speak about him, not with him” (Habermas 1996: 1478). I had hoped that the confessional and simultaneously playful style of my essay would have led to a more forgiving response. In any case, ad hominem attacks on other academicians —in an apparent inability to argue with their ideas— are highly unlikely to foster the development of criminal justice education and scholarship. I also believe that it does not harmonize with the inclusive orientation of most criminal justice scholars and the likewise cross-disciplinary focus of sociologists and other disciplinarians. This admirable bridge-building attitude on at least one occasion even brought the participants of the present debate together in one and the same handbook (DuPont-Morales et al. 2001). Given the nature of Hemmens’ “Reply,” I am unable to fully formulate my position on relevant matters in this debate in a emotionally detached and useful manner. I refer readers of this newsletter to my original essay (Deflem 2002) and offer only some additional thoughts. A view of a Criminal Justice course as offering an introduction to the criminal justice system is insufficiently precise and fails to draw distinction between description and analytically grounded explanation in terms of a specified framework of inquiry. It so misses the Weberian insight to distinguish between the moral, internal, and external viewpoints that demarcate normative, professional, and academic perspectives. The course I taught at Purdue was a sociological one, it was advertised as such, students signed up for it as such, and I taught it as such. I assigned a text by (not about) Durkheim because Durkheim’s work is foundational to the sociological study of criminal justice and especially useful because of the contentious nature of the popular debates that surround so many matters of criminal justice. I never claimed that sociological perspectives of criminal justice are superior to other disciplinary approaches or to multi-disciplinary and vocational perspectives. They each and all have their place. I was only drawing attention to some of the special pressures in specific institutional settings of teaching, and a related trend in higher education which has been very well documented and reflected upon (e.g., Bellah 1999). I therefore also noted that the teaching of criminal justice, irrespective of its institutional context, is often seen as training, even when it is not. My essay clearly implied a call to further develop and institutionalize different kinds of criminal justice education, at the exclusion of none. In this respect, I do not understand why one would take pride in the fact that most students from a Criminal Justice Administration program do not become practitioners and leaders in criminal justice, particularly when the program self-identifies as “both scholarly and professional” (The Criminologist, July/August 2002, p. 22). I agree that I belong in sociology. That is also where I am, though I never thought that I would ever see my professional identity used as a strategy of exclusion and insult against me. Hemmens’ call for criminal justice scholars to separate themselves from the scholars of other academic programs, even if they would not like it, is not only offensive but also misguided. A claim for identity of self implies a claim for acceptance by others, and not only in matters of research but also with respect to teaching and professional service. The fact that an educational program does not produce professionals does not necessarily imply it is scholarly in orientation. Conversely, I am always delighted when some of my former students decide to enter the professional world of criminal justice and law. Moreover, academic scholarship is determined primarily by the kind of questions that are addressed rather than how much research is done or even what method is used. Then, it should be noted with all due humility that the degree of scienticity is generally not high in the social sciences, including sociology (Black 2000). Also, as Robert Merton (1972) observed some time ago, the strains towards separatism in the institutions of science come with great difficulties for the separated groups to have their claims of solidarity accepted as epistemological and ontological claims. My essay was written in the spirit of a participatory model of dialogue. I therefore also criticized, rather than joined, the chorus of scholars who debunk the supposed uncritical nature of criminal justice education. Judging from Hemmens’ “Reply,” my objectives may not have been reached. Still, I am confident that many criminal justice scholars, in professional, disciplinary, and inter-disciplinary settings, will have many more serious arguments to defend their educational and scholarly positions, whether they differ from mine or not. Bellah, R.N. (1999). Freedom, coercion, authority. Academe 85(1), 16-21. Black, D. (2000). Dreams of pure sociology. Sociological Theory 18, 343-367. The Criminologist (July/August 2002), p. 22. Deflem, M. (2002). Teaching criminal justice in liberal arts education: A sociologist’s confessions. ACJS Today 22(2), 1, 3-5. DuPont-Morales, T., Hooper, M., & Schmidt, J. (Eds, 2001). Handbook of Criminal Justice Administration. New York: Marcel Dekker Publishers. Durkheim, E. (1972). The science of morality. In A. Giddens (Ed. ), Emile Durkheim: Selected Writings (pp. 89-107). Cambridge University Press. (Original Work published 1887). Habermas, J. (1996). Reply to symposium participants. Cardozo Law Review 17, 1477-1557. Merton, R.K. (1972). Insiders and outsiders: A chapter in the sociology of knowledge. American Journal of Sociology 77, 9-47. Published in ACJS Today 23(1):13, 2003. With respect to a debate which I had originally envisoned to be about the teaching of criminal justice (Deflem 2002a), I regret to again have to bring up more elementary matters in light of the comments made by Craig Hemmens (2002a, b; Deflem 2002b). Anybody is always welcome to agree or disagree with my statements, but I would hope they do so without being offensive and without distorting my ideas. Yet Hemmens has misrepresented my ideas in every conceivable way and he does so again in his Rejoinder, not so much by misspelling my name, but most strikingly precisely then when he categorically denies taking any quotes out of context. I ask the reader only to read what is written. Hemmens writes that “[Deflem] says that he decided to ‘teach what would surely be the easiest class anybody could ever take at the university’ and to advertise the course as ‘easy, fun, and a wonderful opportunity to watch me sell out big time’” (Hemmens 2002b, p. 11). In fact, however, the original statement in my essay reads as follows: “My immediate reaction was to teach what would surely be the easiest class anybody could ever take at the university. I also decided to recruit heavily from the courses I was teaching at the time, advertising the course as easy, fun, and a wonderful opportunity to ‘watch me sell out big time!’. Yet, fortunately, that is not what happened, for from the seeds of spite grew what would be a great experience for the students and their instructor alike” (Deflem 2002a, p. 3, emphases added). I ask readers only to read, especially before they write. Deflem, M. (2002a). Teaching criminal justice in liberal arts education: A sociologist's confessions. ACJS Today 22(2), 1, 3-5. Deflem, M. (2002b). Reply to “Reply.” ACJS Today 22(4), 10-11. Hemmens, C. (2002a). Teaching criminal justice: Reply to a sociologist. ACJS Today 22(4), 8-10. Hemmens, C. (2002b). Independence Day: Rejoinder to Professor Deflem. ACJS Today 22(4), 11-12. See also other writings on crime and criminal justice.